The Basics of Dimmers: Why Install Light Dimmers? Dimmers allow you to adjust the output levels of your lights, and are a great way to get the perfect ambiance and lighting levels in any space. They’re useful for creating the ideal atmosphere or to reflect a specific time of day by complementing or offsetting the amount of daylight coming into a space. For example, if you've installed dimmers in your living room, you'll be able to easily darken the room while you’re watching a movie, but brighten it if you want to read or work. Dimmers can be ordered for just about all applications, from simple single-room dimming to commercial dimming, and architectural lighting. There are a variety of benefits dimmers offer, in addition to giving the user complete lighting control. Dimmers can actually increase the lifespan of your fixtures and reduce your energy consumption, since they reduce the wattage used by a connected fixture, so they’re excellent for installation in both residential and commercial spaces. You’ll always want to choose a dimmer that’s compatible with your specific light fixture or lamp. You need to match the dimmer to your load, because individual fixture characteristics require specific dimming technologies for safe, quality installation. What are the Different Types of Dimming Technology? Dimmers use an array of technologies to control light sources. Some common dimming technologies include Forward Phase, Reverse Phase (ELV), and 0-10V. Forward Phase: Forward phase-cut dimming (commonly referred to as incandescent or Triac dimming) is the most common dimming method. It’s designed for resistive or magnetic low-voltage (MLV) loads, including incandescent and halogen, but certain models allow for more usage with CFL and LED loads. It usually uses a TRIAC dimmer that phase cuts the leading edge of the AC sine wave. Forward phase dimmers are often more affordable and simpler in terms of design than other types of dimmers. Reverse Phase (ELV): Reverse phase-cut dimming is designed specifically for low-voltage (ELV) systems and almost always requires the use of a neutral wire. It usually uses a MOSFET dimmer that phase cuts the trailing edge of the AC sine wave. ELV dimmers are generally very compatible with LED loads, offering smoother dimming to low levels. 0-10V: 0-10V dimming is commonly used for commercial fluorescent and LED installations and is one of the simplest and earliest commercial dimming methods. Control of the light is performed by a dedicated DC voltage signal that ranges from zero to 10 volts. This allows the controlled light to operate at 100 percent light output when full voltage is passed, 0% output when no voltage is passed, and at any dimmed percentage in between based on the voltage level of the control signal. DMX: Digital Multiplexing (DMX) is a digital signal interface standard that came about due to the more rigorous needs of the theatrical lighting industry. Now increasingly used in architectural and accent lighting applications, it allows for digital communication of individual fixtures using a low voltage control signal. Up to 512 addresses can be using in a single DMX universe. Learn more about DMX lighting. DALI: Digital Addressable Lighting Interface (DALI) is a two-way digital lighting control system protocol used in building automation in commercial applications. Forward Phase and Reverse Phase dimmers control attached light figures using the AC power, which simplifies installation and wiring. On the other side, 0-10V, DMX, and DALI dimming systems utilize a dedicated control signal that is separate from the AC power. While this adds some complexity to the installation, it results in greater system performance and reliability. There are many dimming options out there, and pros and cons to each, but be sure to choose a dimmer that’s specifically designed, tested, and UL listed for your lighting source. What are the Dimmer Location Options? Single-pole: Single-pole dimmers are designed to provide dimming control from only one location. 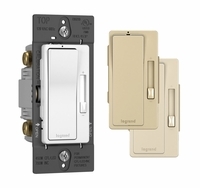 Three-way: Three-way dimmers also adjust the lighting levels of your space from one location, but can be installed with three-way on/off switches that allow you to turn the lights on to the dimmer level from a variety of different locations. Multi-location: Multi-location dimmers are typically paired with accessory dimmers that allow you to fully control and dim the light output from many locations. You can always contact us if you have any more questions about which type of dimmer to choose for your space, budget or powering requirements.